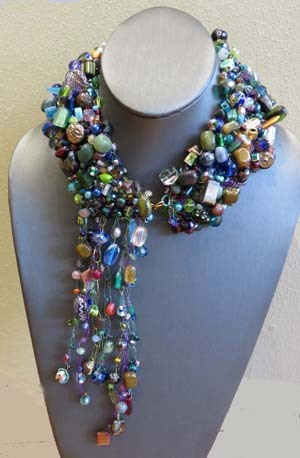 Carrie Lambert of Loveland, Colorado, created this necklace by crocheting and weaving wire strung with beads. When Carrie Lambert started crocheting with wire and beads in 2006, she had no plans for going into business. She started on a whim, teaching herself from a book that caught her eye in a craft store. Two months later she and her husband were eating breakfast at a B&B in Utah when the hostess told her she loved Carrie’s necklace and asked if she could possibly buy it from her. Carrie agreed to sell it to her. On discovering that Carrie had made it, the hostess asked her if she would provide a dozen more for the B&B to sell in its small gift shop. Two weeks after the hostess received the necklaces, she called Carrie and ordered a dozen more because the others had all sold. Nine years later, Carrie’s jewelry matches the trendiest styles of 2015 and sells in stores in Fort Collins and Loveland. 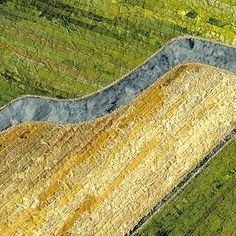 During the nine years since she started, Carrie has altered her style, her materials, and her techniques. She has also changed her own expectations. 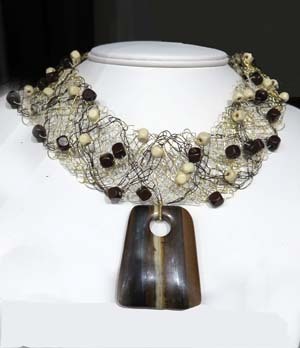 Carrie Lambert wove strands of crocheted wire strung with beads to create this necklace on display at Rabbask Designs in Loveland. At first it bothered her that she can’t control exactly where beads lie within a bracelet or necklace. In addition to stringing the beads onto colorful wire, she crochets and weaves the wire. Even after years of experience, it’s impossible to predict where particular beads will lie in relationship to each other. Instead of fighting the phenomenon, Carrie says she now celebrates randomness. She selects the colors and types of beads she wants – mostly glass beads measuring a few millimeters – and mixes them together. Then she starts stringing them onto wire without consciously selecting what bead will come next. 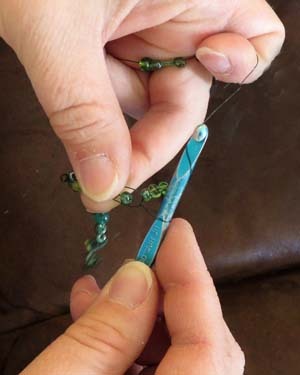 She can vary how tightly spaced the beads are by how she crochets the beaded wire. Nevertheless, where the beads will end up in the finished work is a matter of chance. Carrie Lambert determines how tightly spaced beads are in her finished jewelry by varying how frequently she crochets between the beads. 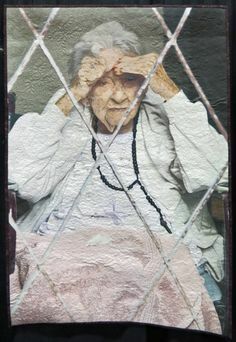 In the beginning she used craft wire available at any hobby store, but because of its stiffness, it hurt her hands. Eventually she discovered that copper wire manufactured by Paramount Wire Company is easier on her hands and more malleable. It also comes in more colors, and its non-tarnish coating prevents changes in the wearer’s skin color. Not every craft store stocks wire from Paramount, but Carrie found it at Bead Bling in Loveland. She keeps about 25 colors on hand in 28 gauge for crocheting. Paramount makes heavier gauge wire in the same colors, and Carrie buys that too to make S-hook and jump ring clasps that match the color of each piece she creates. Creating closures that won’t break took experimenting and growth on Carrie’s part. Today, in a process jewelry makers know as wire wrapping, Carrie winds wire neatly and tightly around each end of her necklaces and bracelets to create a secure place to attach hooks and jump rings. Carrie is happy to share all she has learned with others. She teaches classes regularly at Bead Bling in Loveland, where she purchases all of her wire. 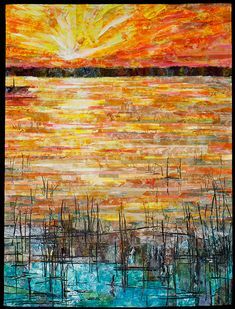 A lifelong love of willow trees inspired Carrie Lambert to create them with beads and crocheted wire. 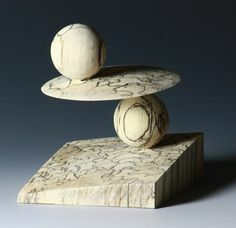 This month Carrie is the featured artisan at Trimble Court Artisans in Old Town Square in Fort Collins. 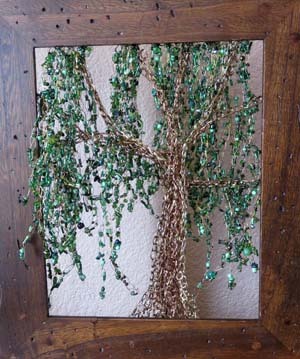 In honor of Arbor Day on Friday, April 24, her display at the front of the store includes her willow trees of wire and beads mounted in wood frames. Her trees are inspired by a lifelong love of willows and the memory of standing underneath them. The tree pictured here is a work in progress. Like all of her willow trees, it can be viewed from either side of the frame. 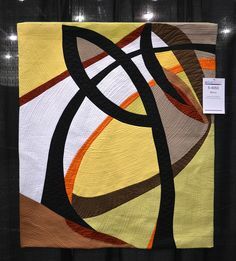 The trunk and branches consist of three colors of wire — black, antique copper, and gray — crocheted together and twisted with numerous other crocheted strands. Strands of beads hang relaxed from the top of the frame. Carrie has calculated that even her smallest trees contain thousands of beads. Displayed below her trees are numerous necklaces, bracelets and earrings. The selection is largest now, while Carrie is the featured artisan. 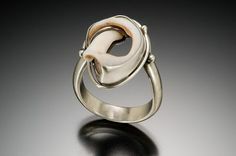 Rabbask Designs on 4th Street in Loveland also carries a variety of her necklace and bracelet combinations. Lady Gaia on Corbett Drive in Fort Collins offers a small assortment of Carrie’s jewelry as well. Carrie sells her simplest jewelry through her Etsy shop called Hurricane Carrie Creations. Carrie grew up believing she had no artist in her. Her teachers discouraged her from thinking about art and directed her thoughts to math and science. Carrie is still working on her master’s degree in ecology, but these days she spends more time at her craft. Sometimes even the experts don’t get it quite right. This entry was posted in Jewelry and tagged A, crochet with wire on April 22, 2015 by Sally. This is just amazing! I love everything about it, but when I got to the picture of the willow tree, I was just blown away!! She is amazingly talented! Thanks for highlighting her talents! Carolyn, You really did just make my day! Make sure to check out all four seasons on display at Trimble Court this month. I saw samples of Carries jewelry soon after she got started and was impressed then. 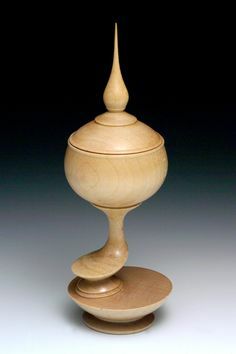 Now I am absolutely amazed at her artisan talent and creativity. Am so happy for u Carrie and am sure the demand for your creations will continue to grow. Thanks for your comment, Carol. I only know her recent work. It would have been fun to watch her develop her craft over the years.